From a substantial and delightful heritage style timber home of 20 odd years in Australia to an ocean going sailing catamaran roaming the southwestern Pacific Ocean for the last eleven years, we have now stepped out of those particular boxes into our current abode which sits precariously but adventurously on four wheels. 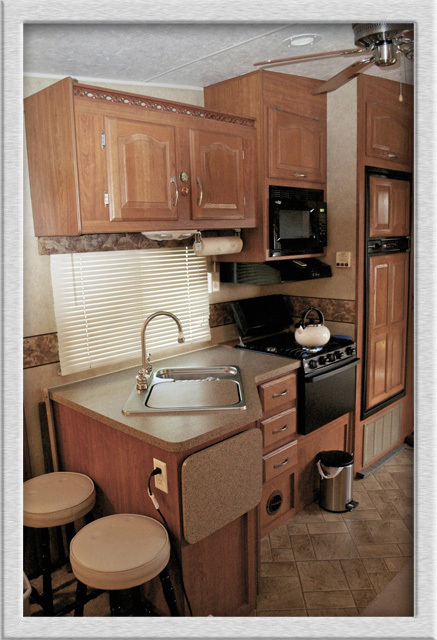 A desire to spend our early retirement years traveling and sightseeing the US has led us gingerly but excitedly into the well established world of motorhomes, fifth wheels and Recreational Vehicles in general. After drifting around the perimeter of the RVing lifestyle on several previous trips to the US and knowing our inherent and native Australian desire for travel and adventure, we were easily ‘bitten’ by this particular ‘bug’. 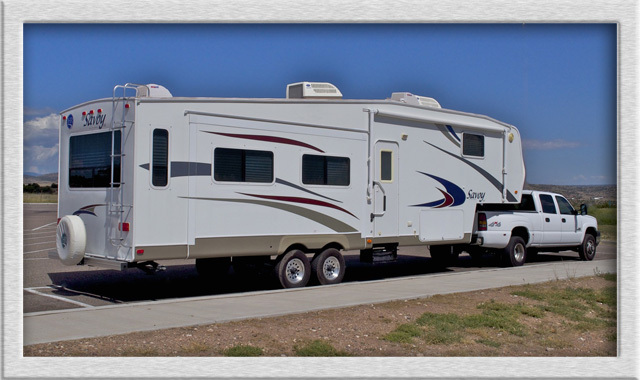 Standing that very first time in a brand new fifth wheel at a Colorado Springs RV show back in 2006, I slipped unresisting into the world of daydreams, meandering through The Grand Canyon, Route 66, Florida, Alaska, never once stopping to take off my rose colored spectacles. A nudge from my wife brought me back to reality and to the questions of how, when and, of course, finances. But that’s another story and one, perhaps, for a ‘history’ page! My wife had the good sense to limit the size which, however, eventually grew from 30ft to a 34 feet. 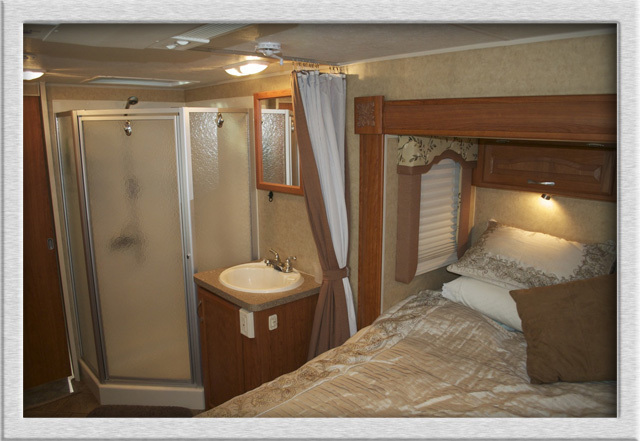 We didn’t want the fifth wheel to be a weight burden on the truck which might spend the next two or three years struggling with its load..
She also wanted a bedroom whose bed went sideways across the coach within its own slideout. This provided a lot more closet space with sliding mirrored doors and drawer spaces. The large mirrors also have an enhancing visual effect on the perceived space. Heather had also taken a great liking to the larger space offered by a rear kitchen floorplan but that desire gave way to a centrally located and slightly smaller kitchen plan in order to accommodate other layout considerations. That smaller kitchen has, over the few weeks of ownership, proved to be somewhat inadequate for full time living but we have some plans for minor improvements to the layout. Having spent two years of fairly intense research we had a better idea of models, floor plans and prices. Eleven years of living on our 41 ft catamaran had given us a good understanding of how much space we would need. 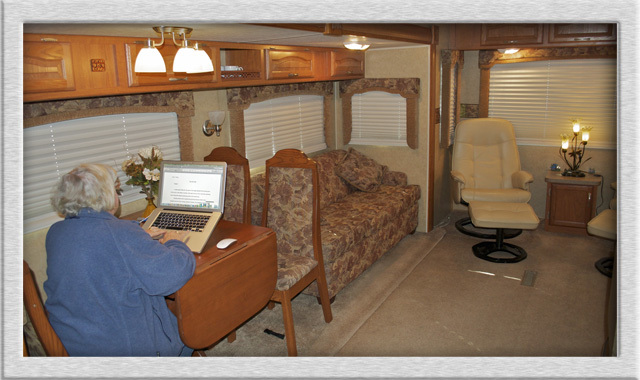 As a writer and author of several books Heather could not be without her laptop or the necessary sitting comfort of several hours a day in front of its screen. I also enjoy my own fairly constant interaction with a computer whose much larger 27 ” screen needed a more permanent setup. For this and several other reasons we needed a more permanent office desk space. During our research of 5th wheels of various vintages, I came to the conclusion that the most space for a given length came in the form a floor plan with two of its slideouts on opposing sides at the rear of the coach. This gave a very open living space of fourteen feet from wall to wall within the slideout area and plenty of walking space between the fixed furniture. I really like the cream leather Euro chairs with their matching Ottoman stools, Heather had a desire for a table and four chairs rather than the dinette style of dining area. Our other requirement was to be able to use the kitchen/dining area and also the bedroom on those infrequent times when it was inconvenient, or even impossible, to run the slides out. Some clever designing on the part of Holiday Rambler gave us almost all of our desires in the form of their 2008 Savoy 34ft model….well done guys!